The LFH&HS have published monumental inscriptions with burial register/ grave occ. lists for St George the Martyr: July 1742 - May 1899 and for St Mary's: Mar 1843 - July 1855. Details about the census records, and indexes for Preston. There are more than 30 churches identified in this place. Please click here for a complete list. You can also perform a more selective search for churches in the Preston area or see them printed on a map. A description of Winckley Square. Ask for a calculation of the distance from Preston to another place. "PRESTON, a parish, market and manufacturing town, and municipal and parliamentary borough in the hundred of Amounderness, county Lancaster, 21 miles S. by E. of Lancaster, and 218 from London by road, or 2.10 by the London and North-Western railway. There is a joint station for the East Lancashire, North Union, and Preston and Wyre lines, which, with the Lancashire canal, afford ready communication with all the great centres of manufacturing industry in the N. of England. The parish, which is of large extent, comprises, besides the borough of Preston, the chapelries of Ashton-on-Ribble, Broughton, and Grimsargh, and the townships or hamlets of Barton, Claughton, or Gloton, Fishwick, Haighton, Lea, and Ribbleton. The manor was held by Earl Tosti, brother of Harold II., before the Norman conquest, but was subsequently forfeited, and came in the reign of Richard I. to Theobald, brother of Archbishop Hubert. The town, which was anciently called Prestum, or Prieststown, from the number and extent of its ecclesiastical establishments, stands on an eminence near the head of the estuary of the river Ribble, about 10 miles from the sea at Lytham. It is of great antiquity, and is supposed to have arisen from the ruins of the Roman station Coccium, or Rigodunum, 11 miles higher up the river, now occupied by the village of Ribchester, near Stonyhurst. It was made a borough by Henry II., who granted the merchant guild, which is still commemorated by a jubilee held by the corporation every twenty years. It was assaulted and partly destroyed by fire by the Scots under Robert Bruce in 1323. In the civil war of Charles I. it declared for the king, and was besieged and taken by the parliamentary forces under General Fairfax. In 1648 the Scottish army, under the Duke of Hamilton, advanced to Ribbleton Moor, in the neighbourhood of the town, but were there met by the parliamentary forces under Cromwell and Lambton, and sustained a severe defeat. In 1715 the town was occupied by Foster, Derwentwater, and other adherents of the Pretender, who erected barricades for its defence, but after a brave resistance were routed by General Willes. In 1745 it was occupied by the retreating forces of the Pretender, Charles Stuart, but was evacuated on the approach of the royal forces under the Duke of Cumberland. In 1835 the parish of Preston contained the townships of Preston, Ashton, Lea, Cottam and Ingol, Barton, Broughton, Haighton, Ribbleton, Grimsargh and Brockholes, Elston, and Fishwick. 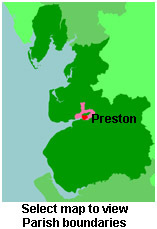 You can see the administrative areas in which Preston has been placed at times in the past. Select one to see a link to a map of that particular area. The history of Preston from Pigot's Lancashire directory, 1830. A description of Preston in times past. View maps of Preston and places within its boundaries. The Workhouse site has an interesting description of Preston workhouse. For probate purposes prior to 1858, Preston was in the Archdeaconry of Richmond. The original wills for the Archdeaconry of Richmond are held at the Lancashire Record Office. You can also see Family History Societies covering the nearby area, plotted on a map. This facility is being developed, and is awaiting societies to enter information about the places they cover.